This entry was posted on Tuesday, February 6th, 2018 at 6:15 pm	and is filed under Win-It-Wednesday. You can follow any responses to this entry through the RSS 2.0 feed. You can leave a response, or trackback from your own site. They all sound wonderful, but mango sounds amazing! 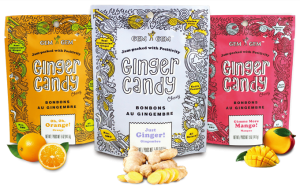 Mango Gem Gem Gluten Free Ginger candy looks great for me. The orange flavor looks the best to me. Mango Gem Gem Chewy Ginger Candies looks the best to me! I would like to try the orange. Mango ginger! It has never even crossed my mind you could mix them, but I am so excited to try! Sounds like an exotic tea blend!!!!! For when I have nausea the Just Ginger are my favourite, but for a little sweet treat, I reach for the Lemon. The mango looks really good to me. Would love the just ginger! The Just Ginger looks great! I think that I would also like the lemon flavor. I think it will be fun to try all the favors, but I think I am most excited for the pure ginger, your favorite! I love Mango but think I’d love ginger alone too.